Small-business project management (PM) software buyers have a wide range of options. From basic to advanced capabilities, on-premise to cloud-based offerings and general-use to industry-specific platforms, it can be hard to know where to start when researching solutions. What’s more, different types of buyers tend to look for different project management software features and functionality. Among PM software buyers who contact Software Advice for help, the capabilities they want their system to have varies greatly by job title. In this article you’ll learn what capabilities managers and executives most often request, the common problems these buyers are looking to solve and how software can help them achieve their goals. As a project manager, you have a different perspective than the executives whose approval you need to purchase a new PM system. While you’re on the ground dealing with employees and day-to-day workflows, execs are big-picture people. These different perspectives are reflected in what functionality small-business buyers who are looking for Web-based PM software request, as seen in Software Advice’s 2015 analysis. 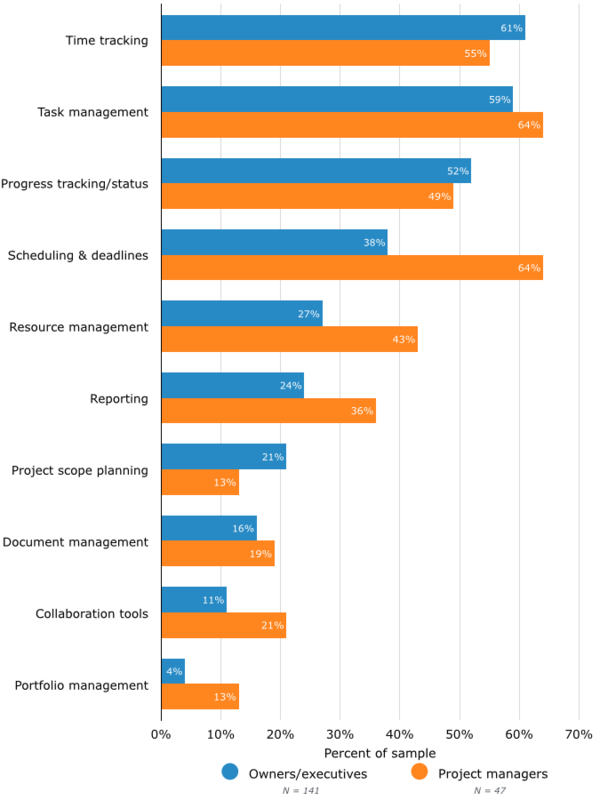 As you can see, more project managers than executives seek management software features for scheduling and deadlines, reporting and resource management—which allows users to plan and allocate personnel to current and future projects. On the other hand, more executives than managers want functionality for time tracking, progress tracking and project scope planning. While setting schedules, managing resources and analyzing reports is often the territory of project managers, executives can also benefit from software with this functionality. What’s more, the open channels of communication and transparency that PM software facilitates can help contribute to future success. What managers do: Set deadlines, dependencies and constraints and visualize work breakdowns. This allows for greater accuracy when establishing project scope and goals. 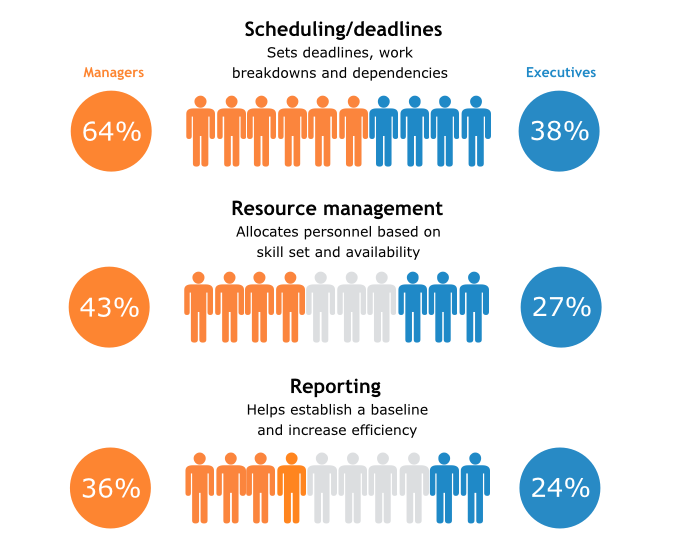 Where executives come in: Effective scheduling and utilization of resources plays an important role in project scope planning: a functionality requested by 8 percent more executives than project managers (see chart above). What’s more, poor resource management and scheduling are major offenders in scope creep, which is often the root cause of project overruns. In other words, it’s in everyone’s best interest to handle these tasks effectively. What managers do: Assign personnel to tasks based on skill set or availability. Should a project need to be postponed or outsourced due to a lack of employee resources, managers can easily escalate issues to the attention of executives. Where executives come in: Once escalated, executives can easily weigh in and sign off on either postponing or outsourcing so the project can stay on track to meet objectives. What managers do: Use data culled from reports to track overall project status and team performance, and monitor daily workflows, dependencies and budget expenditures. They can then present company leaders and stakeholders with more accurate project status updates. Where executives come in: Project status updates set a baseline and precedent, which company leaders can consider when deciding how to invest company time and resources in future projects. 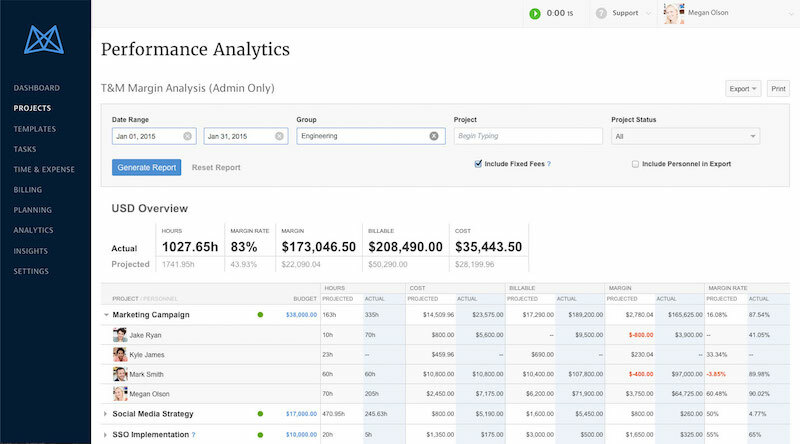 A system with functionality that encompasses both finance and project management. Offers a wide breadth of additional capabilities, including customer relationship management, help desk and ticketing integration. A system that focuses on customizable dashboards and visuals (including Gantt and burn-down charts). So how do you bridge the gap between what you want versus what upper management wants when presenting your purchase case? Show them how automating your day-to-day reporting, resource management and scheduling helps provide transparency and open channels of communication—allowing you to present them with timely, accurate data so they can make long-term investment and business decisions. We know the process of selecting project management software can be daunting. That’s where our Software Advisors come in. In just 15 minutes, they can provide you with a shortlist of products that will be invaluable in your journey to increase project success.